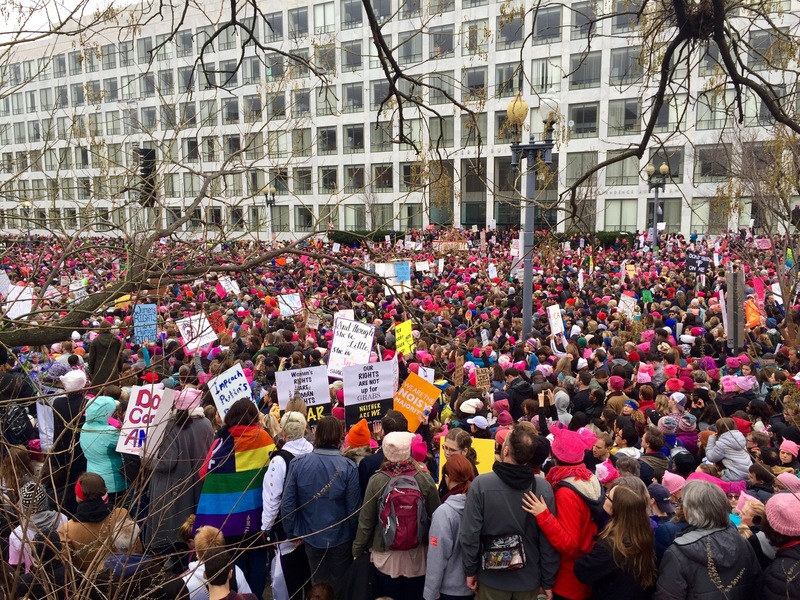 Today women all over the U.S. – and the globe – are marching again on the 1-year anniversary of the 2017 Women’s March that overshadowed the inauguration of our current celebrity President. I had half-written this post last January, and then my spring semester of graduate school took over. I almost completed the entry in June, and then my summer in Nepal took over, followed by my fall semester. So today, as women walk by on the other side of this glass café window wearing their pink hats for a second time, seems like a good time to finally post it. 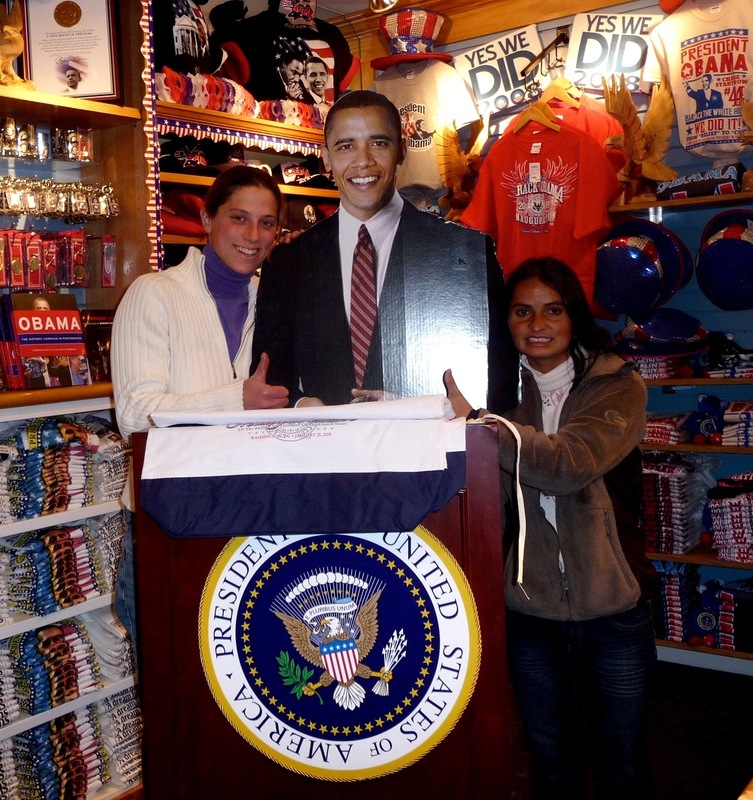 The day that Bishnu arrived in the US for the first time was January 18, 2009. We flew in to JFK and took a cab to my apartment on the Upper West Side. The next morning we got up to find snowflakes drifting past my fifth floor windows, and ran outside with our palms open. Bishnu had never touched snow. We got bagels at Lenny’s and took the train to Washington DC. When we got out in Union Station, the place was exuberantly decked out for President Obama’s inauguration. We woke up to President Obama’s inauguration a few days later. While Bishnu went to register for her first college classes in the United States, my mom and I got in the subway and went down to the National Mall. We’d been able to get seats at the Inauguration through a family friend who is a former member of Congress, which allowed us special access to a maze of hallways under the capitol building itself. Wearing our winter coats and hats, we ran through mysterious marbled corridors, dragging our gloved fingers along the polished walls, and then emerged dizzy in to an ecstatic crowd of tens thousands. It was only a week after Bishnu arrived in this country, and everything seemed enchanted. Almost a decade later, on Jan 21, 2017, my family woke up in Bethesda and once again put on our warm clothes to go down to the capitol. This time, to protest. 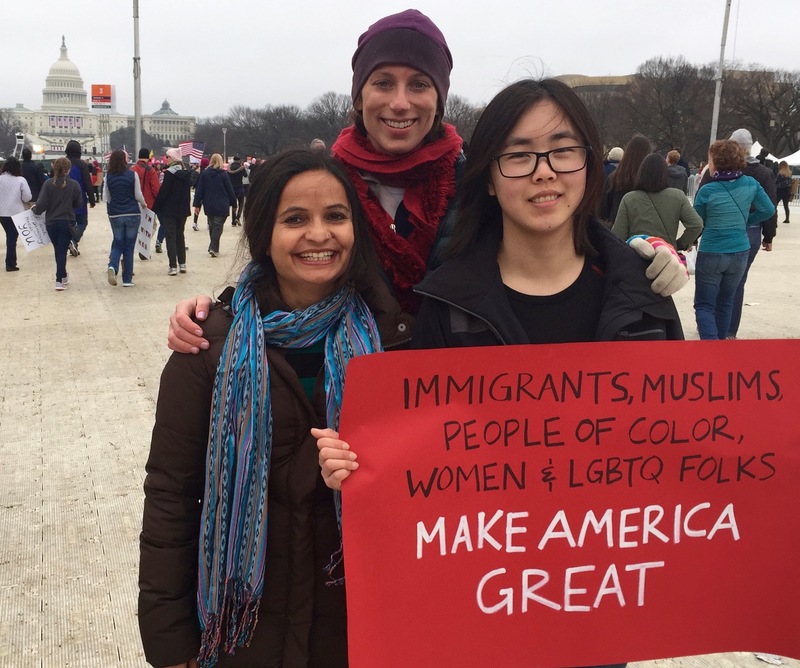 For women’s rights, immigrant rights, tolerance and celebration of diversity and equal opportunity. The previous day had felt…how can I describe it? 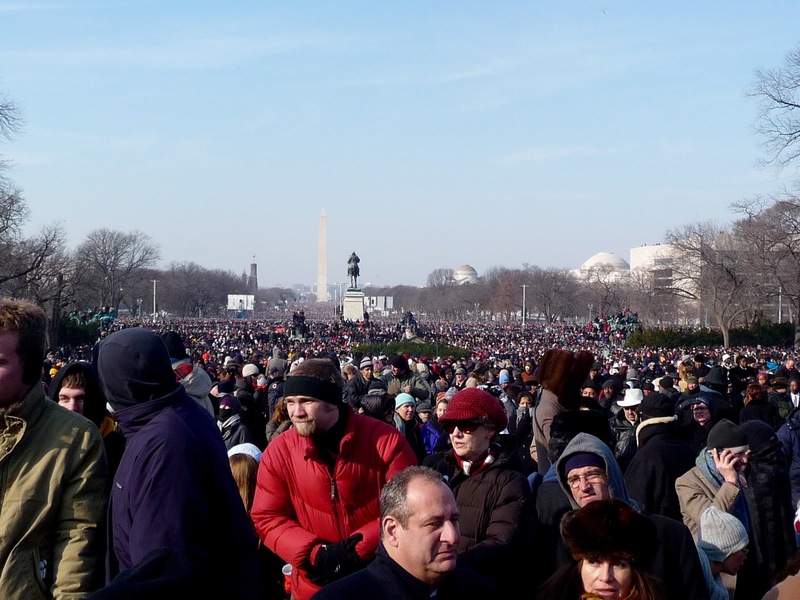 The somberness of President Trump’s Inauguration had been additionally weighted down the tug of that marvelous day eight years ago, which, in addition to the pain and sadness we all felt, created a kind of suction, a vacuum of joy. It seems like Bishnu and I live our lives at bookends. Here we are again. The other side of democracy, the other side of celebration, the other side of the freedom to gather in America. Outrage. Under my winter jacket I put on my #6 Red Hots jersey, which I wore from age 12 to 17 on my youth soccer team. A group of us started playing together as girls, made up the core of the varsity soccer team at our high school, and won my high school’s first ever Independent School League championship in women’s soccer. Our Red Hots coach Chris was on the Jamaican National Team and he was also God. When we were on the road to tournaments in Virginia Beach or wherever, he passed the time by testing us on our ability to understand pidgin Jamaican English. We adored him and he taught us that “anybody can teach a donkey to kick a ball,” but we were going to be “brilliant.” In my Red Hots jersey, I had superpowers. Bishnu, my mom, and my two of my friends and I crammed in to the Metro at Bethesda station just as we had eight years prior. We came up above ground near Pennsylvania Avenue. As we rounded the top of a hill, a sea of people came in to view ahead of us. Immediately, our anger and resentment rose up on a tidal wave of protesters marching toward the capitol. Thousands and thousands and thousands pulling us in with a thrill of momentum. Bishnu and I floated in to the river like two leaves. The events of these past weeks have forced my mind in to new contortions. I have had an easy life. It is easy for me to go to Nepal on a grand adventure, with no idea what I am doing, take my time figuring it out, and be falsely credited with kindness or courage. I can indulge in experiments of curiosity and empathy and generosity, and it doesn’t cost me anything except for the pain, later, of confronting that as a luxury. This is something I have recognized for a good while now. But in the climate of our recent election, the sting is fresh and hot. What kind of world do we live in where empathy is a privilege assumed only after survival? As long as my survival remains easy, what is my responsibility? I waffle between rage at the outpouring of ignorance and bigotry happening here in the United States, and shame at the helium balloon I live on. From up there, it is easy to take the high road. The Women’s March provokes this disquiet, luring it back in from around the edges to the center of my attention. 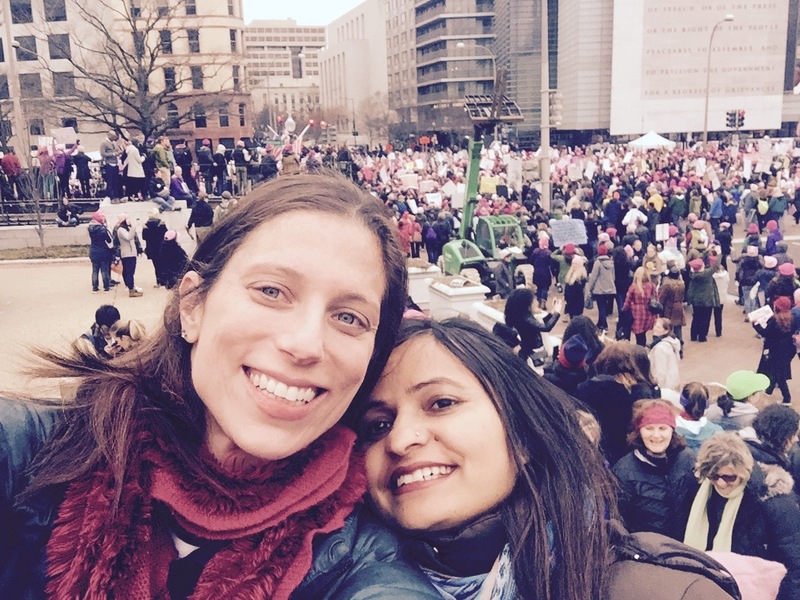 With my mom and our friends, Bishnu and I drift through currents and eddies of elation, passion, and indignation – not all that different from the torrent that welcomed the nation’s first black president, right here where I now stand. But this river swells with anger rather than euphoria. 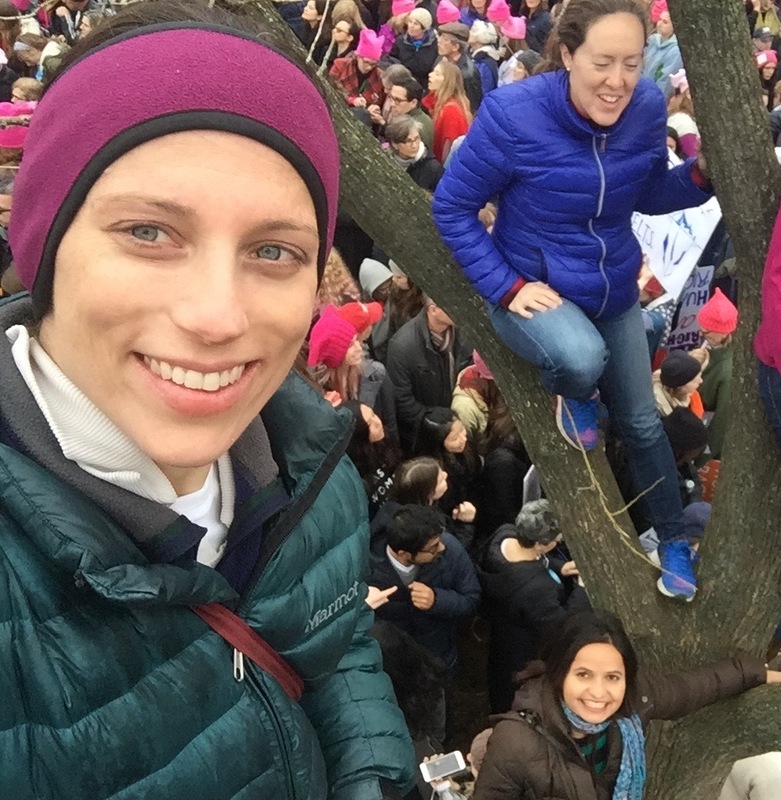 When the speeches start, I climb a tree (for the record, some ladies ahead of me try but can’t scale the long trunk to reach a perch higher up; thanks for help with tree-climbing, Nepal). Bishnu sits on a ledge at the base of the tree. From my location, I can see a vast ocean of people stretching out in all directions, and it is breathtaking. I also can’t help noticing, and being surprised, that it is a predominantly white ocean. Maybe, after today, we’ll feel better, and then we’ll be…you know, busy. Maybe we have a lot of nerve showing up here at all. I cling to the tree branch as words fly past me, originating from massive speakers many blocks away. At the base of the tree, I can see Bishnu looking a little bored, although she is a great sport. I don’t know what she will make of all of this. In the world Bishnu is from, it doesn’t matter what you are doing here in America: if you can get your feet on U.S. soil, you’ve won the golden ticket. Period. Or so it is perceived, for better or worse. You hang on and don’t let go. This thing happens sometimes where I zoom out and I feel I am seeing us from far above. Little me and little Bishnu, like neon dots of radar in an anonymous expanse of blue-gray nothingness, moving in some configuration that must have meaning to it I do not understand. What are they doing? Where are they going? These two little dots…what is their story? Can they explain anything about the topography around them? After all this time, I am no closer to an answer. There we are, leaning on a tree, just as far from something that holds together as when we started. But in the decade and a half we’ve mucked around in each other’s worlds, there is one I thing never stop coming back to. It is always better to show up. Be a little blip of radar. Even if you screwed up the first two centuries. Even if you don’t know what you’re going to do about it next.